In the middle decades of the Twentieth Century, one might never have known that Rolfe High School once sported a girls basketball team. But a photo that I discovered, perhaps in the 1970s, in my parents' archives in an upstairs bedroom at their farm provides evidence that the school did sponsor a team early in the century. I assume we had the photo because my great aunt, Ruth Gunderson VandeSteeg, was on the team. 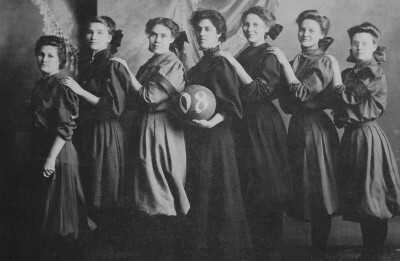 1908 RHS girls basketball team. Left to right: Vinnie Doe, Ruth Gunderson VandeSteeg, Lena Wiegman Vaughn, Coach Stella Hoover, Anna Brinkman Vaughn, May Brinkman Caffrey, Lucille Charlton Hall. The rumors in the 1950s had it that 1.) some Iowa girl had been killed during a game and 2.) strenuous sports activity could be detrimental to a girl in later years–something about inhibiting her ability as a grown woman to have children. 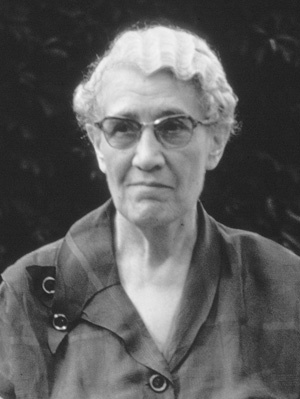 Also, Miss Marcum, the decades long principal, had an inordinate amount of influence, and perhaps her lack of support for girls athletics had something to do with the fact that, for decades, Rolfe did not have a girls team. However, other schools in the area such as Pocahontas, Rockwell City, and Twin Rivers had a long history of successful teams. Even ones that went to the state tournament on a regular basis. I recall working with a few other classmates in seventh grade to get signatures and send a petition to the school board to get girls basketball. But the effort was for naught until Rolfe and the Des Moines Township school consolidated in the fall of 1959. DMT had a successful program, but in its first four years, the consolidated team, known as the Rammettes, won only a handful of games. In 1995, I wrote a long piece of memoir about my experiences with basketball in the Rolfe schools. 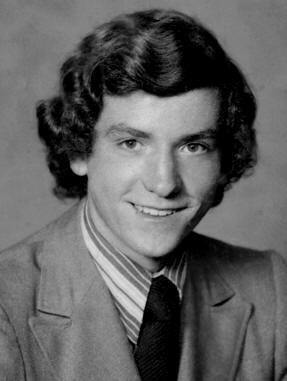 In sixth grade, for physical education, the head high school basketball coach (Mr. Bob Nielsen) comes to the classroom early and gets the boys. The guys go to the locker room, change into their white gym shorts and T-shirts and put on their Converse tennis shoes, then have a full-scale class in the new gym on the basics of basketball. Near the end of the P.E. hour, the sixth-grade teacher (Miss Eva Corsair) takes the girls to the gym, lines them up in single file, in their school clothes (skirts and dresses) to shoot free throws at one of the side baskets. The girl is frustrated, not only because the boys get to wear real gym outfits and have a real workout with the real coach . . . running, jumping, passing, and shooting. What miffs the girl even more is that part of her hour of P.E. has been robbed. It is a disgrace, like being in a prison, to have to sit in that sixth-grade classroom on the second floor near the superintendent's office two-thirds of the P.E. hour while the boys get their workout with the head coach. But to add insult to injury, the teacher requires the girls to count two points for each free throw they make. More than that, the teacher does not acknowledge that the girl is right when she says that a free throw counts for only one point. 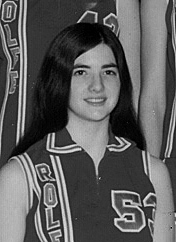 After a decade of slow progress, the early 1970s was an epic era for the Rolfe girls basketball team. In 1971, the team went on the road to the first round of the state tournament at Veteran's Auditorium in Des Moines under the leadership of the late coach Al Van Houten and assistant coach Dennis Duerling. 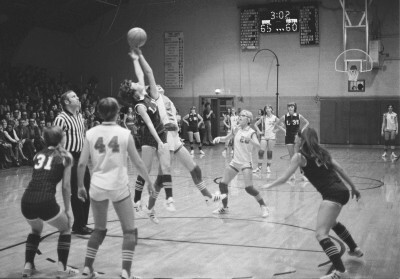 It would be neat for people to submit photos, information, and their perspectives so we could create a mini-history about girls basketball in the Rolfe schools. 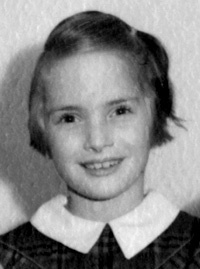 Of course, a lot could be garnered from the school yearbooks, but it is more interesting and usually much better quality to obtain photos that have been kept fresh in a family archive and reminiscences. There are a couple of files related to girls basketball in our audio gallery. Currently, you need the free RealAudio player to listen to them. Perhaps some day, we will create and post MP3 files. Instead of being critical, he said, "I think we can make it to that big barn this year." Of course, he meant the Veteran's Auditorium in Des Moines. Louise also talked about the tremendous pride the team felt with fans from three schools cheering for the Rolfe players at the district finals at Dodger Stadium in Fort Dodge that they won on the road to the state tournament that year. 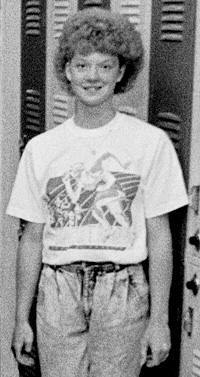 In one of our RHS essays, Jon Jordan of the class of 1972, tells about being a cheerleader for girls basketball. It was the fall of 1971, and the protests against the war in Vietnam were fresh in our tiny minds. Someone had dared me, Jon Jordan, and whatever poor fool I could con into joining me (Larry Loss), to show the faculty what was what, and rock their world by trying out for basketball cheerleading. In another piece from the audio gallery, Sandra Callon McDill speaks at her 1990 high school commencement. It was the last time Rolfe was home to high school students. As part of Sandi's reminiscences, she talked about the town's experimental mergers with other school districts. First, there was the arrangement with Havelock-Plover, then Gilmore City-Bradgate and finally, Pocahontas. The athletes had begun high school wearing the school's traditional colors of red and gold and playing as the Rams and Rammettes. Next they dressed in blue and white and were named the River Valley Rebels. Then in their senior year, even though Rolfe maintained its own academic program, the athletes competed on Pocahontas teams and adapted to Poky's red and white uniforms and the nicknames of Indians and Maidens. In many respects and in hindsight, the history of girls basketball in the Rolfe schools is a rather short one. A dollop of interest in the sport around 1908, then a slow acceptance of the sport in the early 1960s, then a groundswell of support with a huge amount of success in the early 1970s. And by 1990, no more girls basketball at Rolfe. If you wish, send us your photos and stories to flesh out the history. Also, we may be able to find some film footage from the 1970s to post. Forty years later after its epic season and trip to state, the 1971 RHS girls basketball team is on the road again. Assistant coach, Denny Duerling, has informed us that on April 16, 2011, many of the players, managers, faculty, and cheerleaders from the 1971 team will travel back to Rolfe. It will be a day of activities at the RAM Event Center, aka the RHS gym, for them and members of the community to reunite and celebrate that era of Rolfe history. 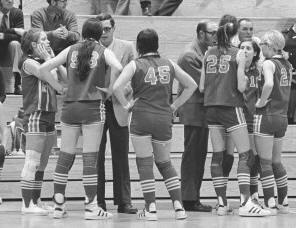 1-3 pm: gathering for the 1971 RHS girls basketball team, cheerleaders, managers, faculty and people who feel a close association to them. The following are open to the Public. 3-5 pm: scrimmages according to the 6-on-6 player rules. 4-6 pm: baked potato dinner with funds raised donated to the RAMS Events Center and Rolfe Betterment, Inc.
6 pm: a presentation, conversation, and video. 1971 RHS girls basketball state qualifying team. Front row left to right: Michele Pomerenke Piprude, Joyce Baade Coburn, Louise Gunderson Shimon, Carol Wiegert Franken, Karen Brinkman Vinson, Laurie Brinkman Jensen. Back row: assistant coach Dennis Duerling, Jean Brinkman Longnecker, Lynn Robinson, Linda Pedersen Tutt, Lynn Neugent Debel, Julie Brinkman Mintz, Jeanell Winkleblack Piconi, head coach Al Van Houten. Click on photo for larger view. Denny Duerling's email also says that Louise Gunderson Shimon (RHS 1973) of Perry is spearheading the event with help from Laurie Brinkman Jensen (RHS 1971) of Ames. Feel free to check the official listing of information that Duerling submitted. Let us know if you have photos, videos, perspectives, or other items to post on this Web site about the history of Rolfe girls basketball. Thanks.